I'm glad and excited to announce that my first ever zine is now available for purchase at my BLURB page! 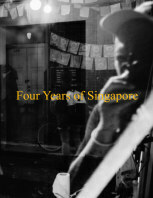 This zine consists of 45+ photographs taken from Singapore of interesting moments and characters! This year, my wife and I decided to return back to my home country and start a new chapter in our lives which made me decide to pay tribute and dedicate my 4 years work of street photographs taken in Singapore to no other than Singapore itself. If you're interested you can visit my BLURB page, alternatively, you can also go to my SHOP page of this website for more prints and zines that will definitely be available soon! By the way, please share the link if you have a few more time on your hands, that would really help to spread my work to a larger audience. I'll really appreciate the help! One of the boat crew waits as we close in to a rock wall. Me and my wife love to travel and I take that opportunity for myself to go and do some street photography. But honestly, I actually find it difficult to do street photography and enjoy traveling both at the same time. Why? As much as I love street photography, I prefer enjoying the adventures with my wife and end up taking photos only when I get the chance. I proved my point when we were in Palawan. The place was so beautiful, I can’t keep my eyes off the scene. Raising the camera seems like a big task. One boat crew takes his lunch while the other looks out in the open water. I don’t turn my “street-mode” switch on when traveling. I just photograph things as it happens. And if nothing happens, I don’t mind at all. I don’t hunt, I just go with the flow. As long as I’m enjoying our trip, I’m all good. Palawan was such a scenic place. Blue and gree everywhere. And when something beautiful happens in front of me, that is when I snap a shot. A few shots and I’m back admiring the scene. A tourist enjoying the water with his snorkeling mask. I can feel his joy from where I’m standing. Finally, I don’t want to feel like I'm working when I’m traveling. Street photography will always be part of the itinerary but never a task to fulfill. Main goal is the experience, next is to record it through photographs.